The Brabus B63-S 700 Widestar is a tuned version of the Mercedes-Benz G63 AMG that has been modified to give 700 horsepower, enabling it to do 0-62 mph in 4.9 seconds and reach speeds of up to 149 mph. A wide body kit and 23-inch wheels adds to the mean look of the police car, with plans for the SUV to promote the “Tune it! Safe!” campaign encouraging drivers to modify their cars legally and safely. 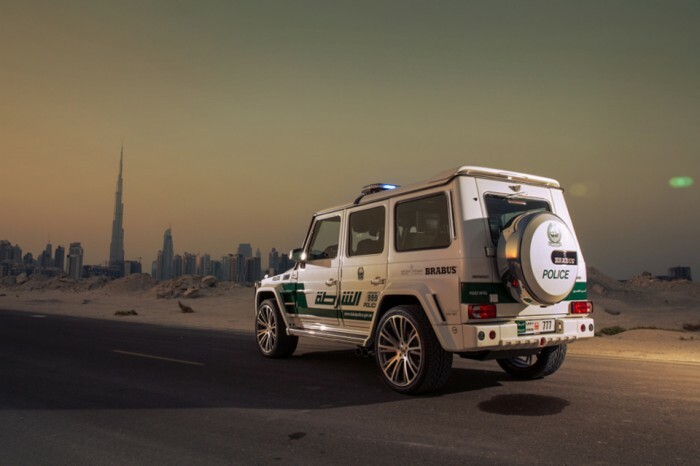 The Brabus B63-S 700 Widestar joins the ever-growing fleet of Dubai Police cars including a Lamborghini Aventador, Aston Martin One-77 and a Bugatti Veyron. This entry was posted in GETDipped and tagged brabus, Brabus Mercedes-Benz, dubai, Dubai Police Fleet, Luxury SUV, Mercedes, Mercedes-Benz G63, Mercedez-Benz. Bookmark the permalink.